Tonight was federal election day in Canada. The Conservative Party of Canada will remain in power and will now have a stronger minority government than before. Prime Minister Stephen Harper was re-elected in his electoral district. Most importantly, the Conservative Party garnered the most support of all major parties; therefore, he remains in power as the Prime Minister of Canada. Congratulations to P.M. Stephen Harper. In Canada, our Parliament and Cabinet are fused together. Unlike the U.S. system of government, the Prime Minister has the power to appoint Cabinet Ministers from amongst the elected Members of Parliament. The ideal is to elect a majority government because it enables the passage of bills into laws without much hindrance from opposition parties. With 143 of the total 308 seats in the Canadian Parliament, the Conservative Party is about 12 seats shy of forming a majority government. Even though it does not get to form a majority government this time around, it will have a stronger minority government. My personal view of Prime Minister Stephen Harper has been quite positive. I see him as a positive person who is level-headed thinker-type who is able to handle the national and international political affairs of the country very adeptly. He is a policy and an ideas-type of person–definitely not a charismatic figure–type like U.S. Sen. Obama, Gov. Palin, and even, Sen. McCain. He may be even less charismatic than some of the other Prime Ministerial candidates—and some might even say boring. However, he is a hard working, intellectual policy wonk who has guided the party in policy development for years, even before becoming leader of the Conservative Party of Canada. What makes a Prime Minister or national leader great is not necessarily charisma and charm, but it is one’s trustworthiness. Harper seems to be a very trustworthy person. His faith in God is steady and seems to be his strength and fortress. He is a good family man married to a good and supportive wife. Overall, I think Stephen Harper has been a very good Prime Minister so far. He will continue to lead our nation of Canada with strength based on character and integrity, supported by the right ideas for the Canadian economy and society. In my home town of Saskatoon, Saskatchewan, all four (including incumbents) are Conservatives. Congratulations to all four: Maurice Vellacott, MP; Brad Trost, MP; Lynne Yelich, MP; and newly elected MP Kelly Block. The Conservative Party of Canada is very popular in western Canada, and has the trust of most western Canadians. It has also made strides in the seat-rich Province of Ontario this election; but the Liberal Party seems to have lost popularity since the last election. The U.S. media doesn’t seem to cover much of Canadian news. None of the networks ever talk about Canada except for weather, like the cold winds coming from Canada. It’s one of the gripes that Canadians have about American news. It seems that Canadians know a lot more about what’s happening in the U.S. and what Americans know about what’s happening in Canada, or even the world. John, the markets seem to have rebounded with some record gains in just the last few days. So when Canadian opposition party leaders and Sen. Obama attack the incumbent leaders about the economy going downhill, it doesn’t make a lot of sense. These are kind of like a flu or a cold. They will go away. These dips and dives are actually a global phenomena and aren’t just specific to the U.S. I feel that people want a politics of certainty and a leader people can trust. PM Harper and Pres. Bush have said that the fundamentals of the economy are good. I agree. Thanks for the update on Canada. I live in Detroit, so I am able to get CBC on the television. Also, I appreciate your views on PM Harper. Unfortunately, we don’t get a lot of Canadian news here in the US, since we are so self-obsessed with this never-ending presidential election here. 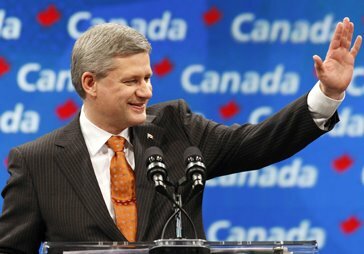 Is Harper’s campaign in decline? In a time of global economic uncertainty, are we seeing a natural inclination of Canadians to be uncertain of politics as well? As the stock markets take dips and dives affected by factors outside of our borders it is understandable that Canadians are in a state of uncertainty on how they would shape the future political landscape of this country.